Recently, some companies are clearly trying to capitalize on the Swine Flu craze that is sweeping the nation. Naturally, someone just had to make an iPhone app, named Swine Flu Tracker. Swine Flu Tracker shows you the current threat level for the disease using a Google maps feed with pins placed in the areas where confirmed or suspected influenza cases have been reported. 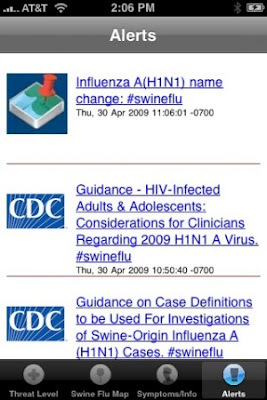 An alert page containing breaking Swine Flu news and a page with Swine Flu facts is also a handy feature that along with your iPhone's GPS can help you flee infected areas on a moments notice. Add Twitter to the mix and you'll be a threat alert legend. Swine Flu Tracker is like playing "Where's Waldo" except there are hundreds of Waldos and they're all carrying a life threatening disease. Which makes playing along much more meaningful. I love the idea of this ingenious but truly helpful app. 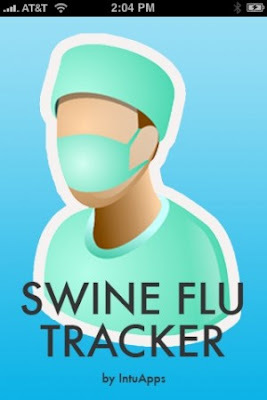 The first person with a Swine Flu Tracker app wins! Congrats IntuApps. Any chance you'll make a Limited Edition Swine Flu Tracker tee shirt? At least eight countries around the globe now have confirmed cases (91 in the United States) of the never-before-seen strain of influenza virus that appears to have only recently jumped from swine to human in a small rural village in Mexico bordering a pig farm. 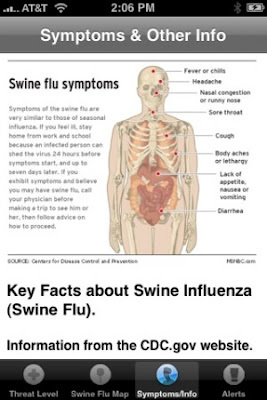 Swine influenza (also called swine flu, pigfluenza, hog flu, and pig flu) refers to influenza caused by those strains of influenza virus that usually infect pigs and are called swine influenza virus (SIV). Swine influenza is common in pigs in the midwestern United States (and occasionally in other states), Mexico, Canada, South America, Europe (including the United Kingdom, Sweden, and Italy), Kenya, Mainland China, Taiwan, Japan and other parts of eastern Asia. A Colorado company may be about to hit the big time, because of what it can do about the swine flu. 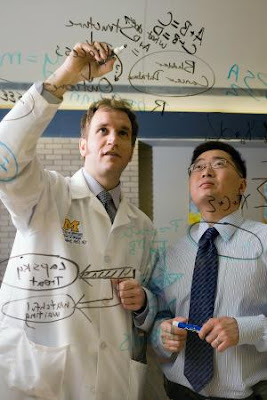 "In-dev-r" scientists have come up with a device that might be able to identify the swine flu more quickly than normal. The "flu chip" can detect which strain of the flu a person is fighting in hours rather than days. It was invented by a former professor at the University of Colorado. The CDC is reportedly talking to "In-dev-r" about sending out the chip to doctors if it works.